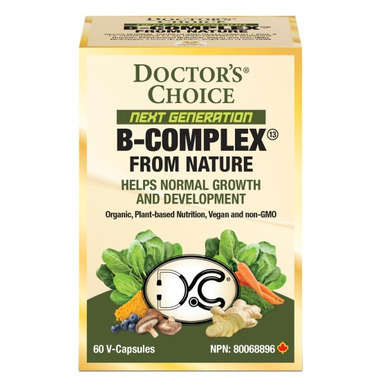 Doctor’s Choice Next Generation B Complex is a completely vegan, non-GMO, organic plant-based B-Complex, with the world’s only Vegetarian Society and Vegan Society registered Vitamin D-3 (others are from fish oils or from sheep’s wool). It has added B-12 (methylcobalamin), Biotin and PABA in a proprietary blend of spinach, blueberry, turmeric and ginger, all sourced from organic sources. Doctor’s Choice B Complex has no hidden additives—it’s everything you would expect from Doctor’s Choice: only what’s written on the label–iron-free, gluten-free, sugar-free, lactose-free, dairy-free, wheat-free and yeast-free. B Complex is 100% natural, and contains no artificial colors, flavors, sweeteners, preservatives or other additives.